SPECIAL THANKS TO EUROWX & TROPICAL TIDBITS FOR USE OF THEIR MAPS!!!!! This is the European snowfall forecast map from last night’s overnight run. European Nam GFS trend northwest with snow and brought back the 1 foot plus snows for Long Island and New York City and actually pushed the northern fringe of that line further north in New Jersey along route 80. This storm remains a tough forecast because the storm is translating from the coast of Delmarva east northeastward and not northeastward toward 40N & 70 W which is snow lovers and meteorologist call the benchmark. Lows that cluster around 40N 70 W which is basically east of Atlantic City and Southeast of Nantucket bring big snows to New York and Boston. This one is oriented more east northeast west southwest so that’s why the snow shield can only get so far. Also notice how tight the snowfall boundries are. You still don’t have to go far to see the snow drop off. However evn this run has more than doubled amounts in areas north of Route 84 in New York State and Connecticut. 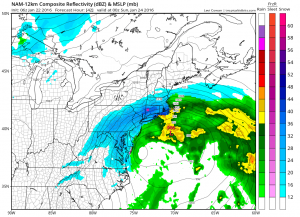 The nam from a few hours ago for Saturday night when much of Southern New England Long Island Southeastern NY and Northern New Jersey are seeing heavy snow with blizzard conditions in some places. 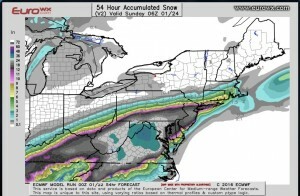 Note that if the nam is right, then the axis of heavy snow could shift even further north. But we don’t necessarily want to go there at the moment.